Cable blowing machines are used extensively throughout the global telecoms and fibre optic cable installation networks and enable single length,mid-point and series cable blowing. 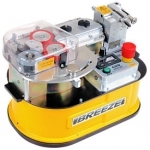 The cable blowing machine uses compressed air to propel the cable through the duct. This method of cable laying provides a consistent, uniform pulling force along the full length of the cable. In addition to a consistent pulling force, CBS cable blowing machines provide smooth control, movement and cable monitoring which is controlled by a hydraulically powered belt system. Over all this provides a safe and optimised method of cable laying and installation which can improve productivity and reduce workforce requirments. CBS Cable blowing machines are designed to be east-to-use without tools and simple to adjust in order to meet site requirements and conditions. T&D UK supply Cable Pulling, Cable Laying and Cable Blowing equipment for HV transmission towers and overhead lines, HV underground cables, LV distribution lines, LV-HV rail trackside and underground power, CATV, fibre optic and telecoms. Video: The CBS Products Tornado Cable Blowing Machine.